Quickly and conveniently to the right product in a few steps. 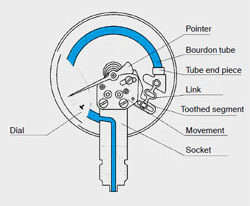 Bourdon tube pressure gauges are used for the measurement of relative pressures from 0.6 ... 7,000 bar. They are classified as mechanical pressure measuring instruments, and thus operate without any electrical power. The C-shaped Bourdon tubes, formed into an angle of approx. 250°, can be used for pressures up to 60 bar. For higher pressures, Bourdon tubes with several superimposed windings of the same angular diameter (helical tubes) or with a spiral coil in the one plane (spiral tubes) are used. Bourdon tube pressure gauges are developed, qualified and manufactured to the EN 837-1 standard by WIKA themselves. We produce Bourdon tube pressure gauges with various common worldwide measuring ranges, process connections, approvals and nominal sizes. For critical applications there are Bourdon tube pressure gauges with liquid filling. Through the case liquid, a precise readability is ensured, even with high dynamic pressure loads. It damps the moving parts within the case and thus prevents damage and increased wear. 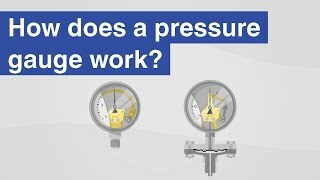 Safety pressure gauges complete the wide portfolio. In addition to a solid baffle wall between the dial and the measuring system, these Bourdon tube pressure gauges feature a blow-out back. Thus, any persons standing in front of the pressure gauge are protected. Equally important for a reliable measured value display is the movement. Our “Swiss movement” mechanisms are not only as precise as a Swiss watch movement, but they are also especially robust and durable. These Bourdon tube pressure gauges are suitable for liquid or gaseous media, which are not highly viscous or crystallising, so long as they do not attack copper alloy parts. The measuring range covers 0.6 ... 1,000 bar. Bourdon tube pressure gauges with increased corrosion resistance are manufactured entirely from stainless steel. They are suitable for the measurement of pressures from 0 … 0.6 up to 0 … 7,000 bar in gaseous and liquid, not highly viscous and non-crystallising media - and also in aggressive environments. 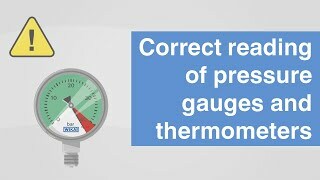 Correct reading of pressure gauges and thermometers | What to look out for?